In dezelfde lijn als EIFThe European Interoperability Framework (EIF) is a commonly agreed approach to the delivery of European public services in an interoperable manner. It defines basic interoperability guidelines in the form of common principles, models and recommendations. 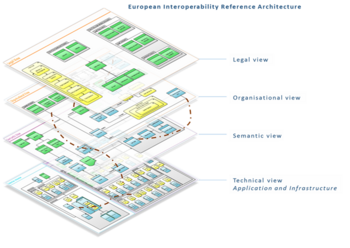 en TOGAF: De EIRA staat op één lijn met het European Interoperability Framework ([http://ec.europa.eu/idabc/en/document/2319/5938.html EIFThe European Interoperability Framework (EIF) is a commonly agreed approach to the delivery of European public services in an interoperable manner. It defines basic interoperability guidelines in the form of common principles, models and recommendations. ) en past binnen de European Interoperability Strategy (http://ec.europa.eu/idabc/en/document/7772.html EIS). EIRA richt zich op de juridische, organisatorische, semantische en technische interoperabiliteits-lagen uit de EIFThe European Interoperability Framework (EIF) is a commonly agreed approach to the delivery of European public services in an interoperable manner. It defines basic interoperability guidelines in the form of common principles, models and recommendations. . Binnen TOGAF en het Enterprise Architectuur Continuum focust EIRA op het Architectuur continuum. TOGAF-termen en paradigma's als achitectuurpatronen, bouwstenen en views worden ook gebruikt in de EIRA.